Orlando - Corona Cigar Co. has purchased a new Hummer H2 that has been completely transformed using 3M Controltac Vinyl that covers 80 percent of the vehicle to showcase the Corona Cigar retail store and several of the store's vendors and their cigar brands. 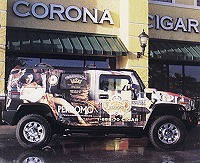 Corona vendors featured on the vehicle include Acid, Avo, Camacho, CAO, Diamond Crown, Indian Tabac, and Perdomo, as well as Corona's signature cigar, Cielo. "Our initial idea for this one-of-a-kind vehicle was to use it as an advertising, promotion, and marketing tool," said Jeff Wojtanowski, general manager and chief information officer, Corona Cigar Co. "However, what we received was an incredibly eye-catching billboard on wheels that generates attention no matter where it goes." Corona's "Smokin' Cruiser" is staying busy on the streets of Orlando and surrounding areas, visiting local theme parks including Walt Disney World, Universal Orlando, and Sea World; tourist districts; and sporting events including the PGA's Bay Hill Tournament, Daytona Speedweeks, and Bike Week. When it's not on the road, the Smokin' Cruiser can be found in front of Corona's world headquarters and retail store in Orlando. New York - General Cigar Co., the exclusive distributor of Kahl�a Cigars Delicioso, kicked off a national retail event series in June to encourage "tenured" smokers to sample the Kahl�a liqueur-flavored cigars. The sampling events provide consumers with a free Kahl�a Robusto cigar. Also, customers who purchase two Kahl�a cigars or a full tin receive a free Torpedo. In addition, a Kahl�a gift box containing each of the Corona, Robusto, and Torpedo shapes as well as a tin are available for purchase during the events at a significant saving from the suggested retail price. A total of 65 events will take place nationally, and are being promoted on General Cigar's website, cigarworld.com. In addition, retailers participating in the sampling events will receive a POS kit containing postcard invitations, easel card and poster, quick screen, and outdoor banner. Chicago, IL - A former public defender in Chicago has been sentenced to three years in prison for smuggling thousands of Cuban cigars into the United States where he then sold them. Richard Connors, 55, was convicted in October 2002 on eight counts of smuggling, conspiracy, and violating the Trading with the Enemy Act, which forbids American citizens from purchasing any Cuban products. Between 1996 and 1999, Connors smuggled thousands of Cuban cigars over the course of dozens of trips to Cuba. He covered his actions by lying to customs officials and mailing his passport home from Canada or Mexico on his way back to Chicago from Cuba, The Chicago Tribune reported. He then sold the cigars for as much as $350 a box. U.S. District Judge Ronald Guzman called Connors' activities "a complex and intricate plan of many steps over a lengthy period of time" and sentenced him in June to 37 months in prison plus three years of probation and fined him $60,000. Easton, PA - Famous Smoke Shop, a leading cataloger and on-line retailer of premium cigars, has launched an on-line auction site to sell premium cigars. The cyber storefront promotes not only Famous' selection of major manufacturer brands, but also harder-to-find cigars such as Fuente Fuente Opus X or Padron Anniversary. Auction buyers can also bid on cigar accessories including humidors, lighters, cutters, and cases. The site, CigarAuctioneer.com, posts dozens of new auctions every day, around the clock. No registration fee is required and auction winners may combine multiple orders into single weekly shipments. "We realize that we may lose money on some items from time-to-time, but we look at CigarAuctioneer.com as kind of a public service, a way of making shopping at our sites more fun. It's also a way of saying �thank you' to our thousands of loyal customers," said Famous Smoke Shop president, Arthur Zaretsky in an announcement to consumers. Customers already registered at Famous-Smoke.com can start bidding on cigars just by logging on to their account. 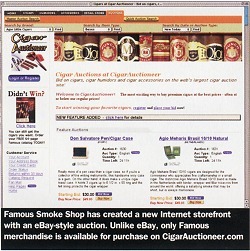 Additionally, a new "Auctions" tab now appears in the menu bar on the Famous-Smoke.com website linking visitors directly to CigarAuctioneer.com. Despite touting drastic sales declines in legal cigarettes following the implementation of a tough smoking ban in bars in restaurants in March, 2003, New York city Health Department officials admit that as many as one in three city smokers have purchased bootleg cigarettes to avoid hefty city and state excise taxes. A series of state and city tobacco tax hikes now total more than $3 a pack, driving a third of city smokers to admit in a Health Department survey that they are buying cigarettes from Indian reservations, through the Internet, by mail, from other states, and even from abroad. "We have seen an increase in the sales of nontaxed cigarettes," Health Commissioner Thomas Frieden said. The same survey showed the number of regular smokers had plummeted 11 percent between 2002 and 2003, and that cigarette consumption had dropped 13 percent, statistics scorned by industry officials and even tobacco stock analysts as "highly improbable." "If people can take advantage of an illegal outlet, you're defeating the purpose of raising the taxes," said Assemblyman Jeffrey Klein, who sponsored legislation that now bans Internet sales of cigarettes. Klein is now preparing to sue certain Native American tribes that have refused to levy tobacco taxes. A carton of cigs that costs $75 in the city can cost a mere $25 on an Indian reservation. Cigarette sales have plummeted by 40% at local convenience stores, says Jose Fernandez, president of the Bodega Association of the United States. He blames lax enforcement for the rampant bootlegging. California: Voters will decide whether to raise telephone surcharges and tobacco taxes to cover the costs of emergency medical care. Colorado: If enough signatures are collected, voters would be asked to raise cigarette taxes by 64 cents a pack to pay for health care programs for the poor and for tobacco prevention programs. Oklahoma: Voters will decide whether to raise cigarette taxes and whether to create a lottery that would fund education. Lansing, MI - Michigan Governor Jennifer Granholm signed a 75-cents-a-pack cigarette tax increase bill into law on June 24, raising the state's cigarette tax to $2 per pack, the nation's second highest, behind only New Jersey's $2.05 per pack tax. The tax on the wholesale price of other tobacco products also increased from the 20 percent previously to 32 percent. The increase became effective on July 1, only a week after it was signed into law. The increase will generate $100 million in state revenue over the next three months to help balance this year's state budget and more than $300 million for the following fiscal year. Michigan retailers near the Ohio, Wisconsin, and Indiana borders are already dealing with the affects of lower-taxed cigarettes, chewing tobacco, and other tobacco products in neighboring states. The tax on a pack of cigarettes is 77 cents in Wisconsin, 55.5 cents in Indiana, and 55 cents in Ohio. juneau-The Alaskan Legislature has agreed to increase the state cigarette tax by 60 cents in the coming year and by a total of $1 per pack over four years. The initial 60-cent increase will take effect in January 2005, raising the cigarette tax to $1.60 per pack. Additional increases of 20 cents a pack will take effect in 2006 and 2007. Alaska becomes the 34th state, along with the District of Columbia and Puerto Rico, to increase its cigarette tax since January 1, 2002.